No matter what type of light fixture you're looking for, choosing the right size is crucial to achieving a balanced look. Pick a fixture that's too big and it can throw off your decor. Pick one that's too small and it's no longer functional. Use our tips below to choose the right size light fixture in a few simple steps. If you need further assistance, give our trained lighting specialists a call at 1-866-688-3562. Then, focus the rest of your energy on the fun part: selecting the perfect light for you! If you are using a chandelier or ceiling pendant above a table, measure the width or diameter of your table in inches. 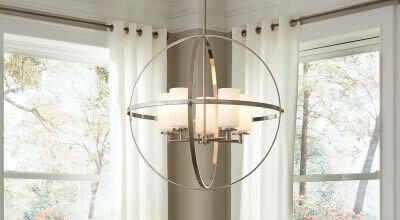 Then, look for chandeliers that are between 2/3 and 3/4 of that width or diameter. Keep in mind that a fixture with a busy or complex design will actually appear larger, so if that's what is catching your eye, you'll want to scale your maximum width down slightly. Assuming you have 8-foot ceilings, the bottom of the fixture should hang between 30 and 36 inches above the tabletop. But if your ceilings are higher, the suggestion is to add 3 more inches above the table for each additional foot of ceiling. If you have a very high vaulted ceiling, it might be best to hang the chandelier from a very long length of chain or a longer downrod so the fixture is hung closer to the people who will be in the room (and who will need light to see), instead of being far up in the ceiling. If you have a long dining room table, you can use 2 chandeliers to light it. In that case, choose fixtures that are 1/3 the length of the table. (A table that's 60 inches long would need two lights with 20-inch diameters or widths.) Center each of those chandeliers over its half of the table. For ambient lighting use, measure the length and width of the room you wish to light. Then convert this number to inches by adding them together. This is the ideal width of the fixture. For example, an 18-inch wide fixture would be ideal for an 8x10 foot room. The standard height for hanging a chandelier in ambient use is 7 feet, but adjust this as needed depending on the size of the fixture, your ceiling heights, heights of the room's occupants, etc. Although they can be a good source of general light, many chandeliers and pendants are not sufficient to light an entire room alone. 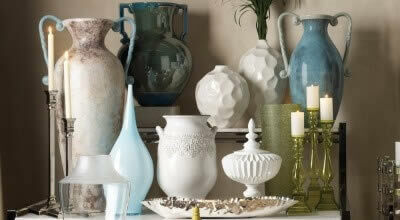 Make sure to add in other sources, like lamps or sconces, for a great mix of light. For ceiling flush or semi-flush mount lights, the same advice about measuring for chandeliers as ambient lighting use can be used here. Measure the length and width of the room you want to light and convert this number to inches by adding them together to find the ideal width of a ceiling mount. Shop our flush mounts and semi-flush mounts! This really depends on the height of your foyer or entryway, though a good rule of thumb is to add up the width and length of the foyer in feet to find the ideal diameter or width of a light. For a typical ceiling height of 9 to 10 feet, make sure the bottom of the light is 7 feet above the floor. But if you have an extremely tall foyer, you may hang the light higher. Be aware of any potential glare in sight lines on second stories or other practicality issues in large multi-story foyers. If you have a picture window near the top of the foyer, center the light there so it can be seen from outside as you approach the house. Create a stylish first impression with our bestselling foyer lights. Measure the width of the bathroom mirror (or mirrors). That number will be your limit for the width of vanity bar lights. Many people choose vanities that are about 75 percent the width of the mirror and then mount them centrally. If you have multiple sinks or a very long mirror, you may need to choose a bar with more lights or even use more than one bar. Allow for 3 inches between the top of the mirror and the bottom of the light fixture if you are using a bath bar. We do recommend using sconces on either side of the mirror instead of a bath bar for the most ideal light, but also understand this is not possible in every bathroom. More information about properly sizing sconces for bathroom mirrors can be found in the Sconces section below. Check out our bathroom light fixtures guide for more advice! Measure the diameter and height of the table where the lamp will sit. Then, keep those numbers in mind when choosing lamp diameters. 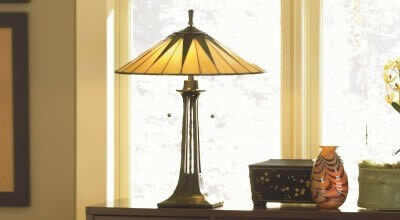 The ideal lampshade location is with the bottom of the shade at eye level when you are seated. You don't want glare in your eyes! Another thing to consider is the type of room where you're adding a lamp. In living rooms, 26 to 34 inches is a good height for a lamp. 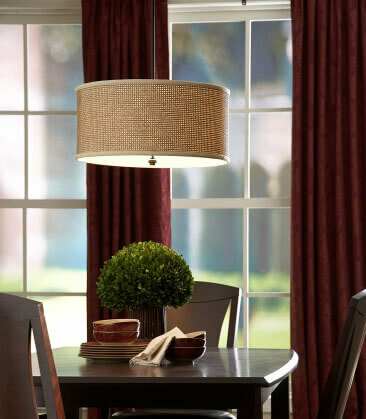 In dining rooms, try slightly taller and slimmer buffet lamps of heights up to 36 inches. 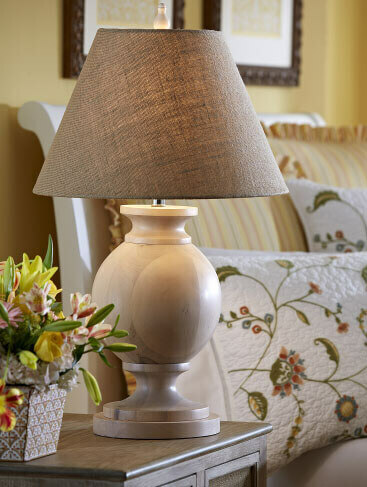 In bedrooms, go for up to 30 inches when lamps are on bedside tables. A great general rule of thumb is that the lamp should be no more than 1.5 times the height of whatever the lamp is sitting on and lampshade diameter should be no wider than the table top. Find your new favorite lamp! If you want to hang pendants over a table or kitchen island, measure the width or diameter of the surface. Then subtract 12 from that number. That's the maximum limit for the width or diameter of a hanging light in inches. Remember that a fixture with a busy or complex design will actually appear larger, so if that's what is catching your eye, you'll want to scale your maximum width down slightly! 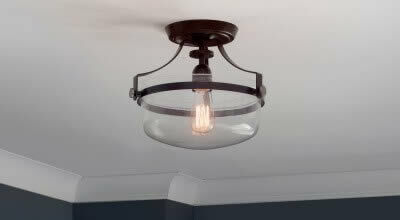 Ceiling pendants should hang 12-20 inches below an 8-foot ceiling. Add 3 inches for every additional foot of ceiling. There needs to be at least 1 foot of clearance for people walking below the pendant. For hanging pendants above an island or table, start with 28-34 inches above said table as a rough guideline, but make sure to consider the sight lines of the people in the room so no one gets glare in their eyes or runs the risk of hitting their head on the pendant. Space a pendant every 2 feet or so above a kitchen island and pick the right size of pendant to suit your island length. Small islands (4 to 5 feet long) can handle 1 large or 2 medium pendants. Large islands can handle 2 large or 3 medium pendants. If you want to use a pendant above a sink, use a smaller one so as not to block out the view (if a window is also there). Remember to leave lots of room for the tallest person in your house to stand at the sink! Hang it higher up than the general 28-34" advice. Come find the perfect pendants! 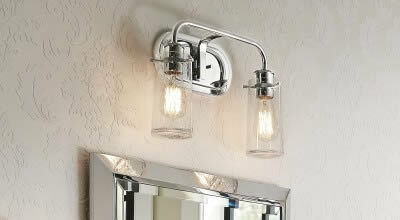 For an average size bathroom, choose bathroom sconces that are about 18 inches tall or a little less. For smaller spaces, try smaller sconces of 12 inches or less. In a larger bathroom, you could go for sconces that are 19 inches tall or even taller! In bathrooms, mount sconces 36 to 40" apart, flanking the mirror, 18 inches from the sink's center line. The rule of thumb is to mount sconces at eye level, often 65" above the room's finished floor. If the sconces have shades, put the bottom edges of the shades a little below eye level. Consider eye level when it comes to reducing glare and ensuring that the tallest person in the space can't see down into the sconce. Allow 4 inches of space on either side of the mirror you want to flank with sconces. (That 4 inches provides the space for the sconce's electrical panel.) ADA-compliant sconces are allowed to extend no more than 4 inches from the surface, which is good for narrow or small spaces. If you want to put sconces on the wall beside a staircase, measure the height of your ceiling and then take its measurement, in inches, and multiply it by 3/4 because most sconces are placed three quarters of the way up the wall. (If your home has 8-foot ceilings, a sconce would then be about 6 feet up.) But that might not be best for your home, especially if you have taller or shorter people living there, so adjust as needed. Also, consider using sconces with an enclosed shade because if you can see down into the bulb, it can hurt your eyes. ADA-compliant sconces are a great idea for staircases. When hanging sconces beside artwork, pick sconces that will be centered beside the picture. To find the center, measure the length of the picture and divide by 2. When you find that center spot, measure 4 inches away from it. That spot will be where you place the center of the sconce. Avoid disproportionate looks by making sure there are 2 free inches above and below the sconce. 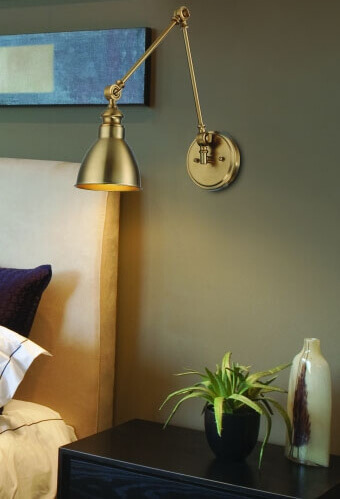 When mounting swing-arm wall lamps beside a bed, get the most ideal height by sitting in the bed normally and then having someone measure the height from the floor to just above your shoulder. The most ideal spot for wall lamps is between your head and the work surface (in this case, things like a book or tablet computer). There are 2 types of general guidelines for picture light sizing based on what type of light you would like: a traditional or slim-line style. Measure the width of the image you want to light first. For traditional style picture lights, if your image is 30" or less in width, look for picture lights that are half that size. If your image is 30" or more in width, choose picture lights that are 2/3 that size. For slim-line style picture lights, if your image is 18" or less in width, look for picture lights that are half that size. If your image is 18" or more in width, choose picture lights that are 2/3 that size. But if your image is very large, like 60" or more in width, look for picture lights that are 3/4 that size. See our bestselling picture lights. 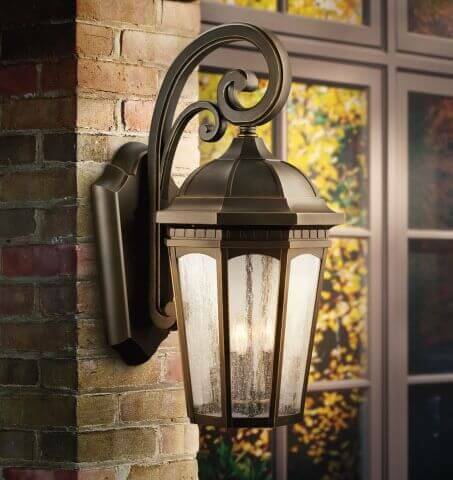 Wall-mounted outdoor lights should be considered based on the height of the door or surface they will illuminate. For just one lantern, go for one-third the height of the door. But if you're flanking with two lanterns, use ones that are a quarter of the height of the door. Mount the lanterns slightly above eye level. The center of the bulbs should be 66 inches above the door threshold. 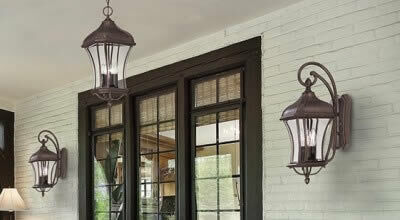 For outdoor ceiling lights, follow the same sort of clearance rules as for pendants. For post or fence lights, go as big as you would like since perspective means the lights will look small from far away. Knowing what size lights should be on the outside of a garage depends on the size of your garage. A 1-car garage can be well-served with one of these suggestions: a larger wall-mounted light between the house and garage; a light over the garage door; 2 smaller wall-mounted lights flanking either side of the garage door. A garage that's 2-car or larger easily supports one light on each side of the door. Or, if your garage has many doors with a break between them, putting wall-mounted lights on the break(s) and each side works well. Make sure your garage lights aren't too small! Choose fixtures that are a quarter to one-third the size of the garage door's height. Centrally-placed fixtures need to be large enough to light the entire width of the driveway, which you can figure out by measuring the garage door height as well as the driveway width. Brighten your great outdoors with these bestselling lights. When using a ceiling fan in a bedroom, the best mounting location is centered above the foot, not the head, of the bed. If a bedroom ceiling fan also has a light kit, this means the ambient light will cover a lot of the room and you won't have light bulbs glaring right above your face when you're sitting in bed. In other rooms, ceiling fans are often mounted in the middle of the ceiling. However, make sure to consider the interference of things like air vents and chimneys when deciding where to place a fan. Ceiling fans need to be at least 12 inches away from walls and air vents. Fans should be at least 7.5 feet above the floor--or about 9 to 10 feet above the floor in rooms with tall ceilings. To learn more about getting the right size ceiling fan for your room, check out our Ceiling Fan Buying Guide. These bestselling ceiling fans will keep you comfortable. To make sure recessed downlights are spread evenly, divide the ceiling height by 2. An 8-foot ceiling, for example, would yield recessed lights placed about 4 feet apart. This is just a general rule of thumb and may not apply, especially if you want to place recessed downlights in very specific areas or you're adding the lights to a small room. If you need to place lights closer together, place them on a dimmer so that you can adjust the light level for comfort. Place the lights about 3 feet away from the walls so that the lights don't create shadows that make the ceiling seem lower. When you're planning out a recessed downlight it's a good idea to draw a diagram of the room first and include representations of the furniture and objects (particularly if you need to put a light above certain things). Learning how to choose the right size light fixture does involve a little measurement and math, but your room will look its best! Remember, if you need any help, feel free to contact us or call us at 1-866-688-3562! Sign up for our email newsletter today and score an additional discount!